A press release from T-Mobile on Tuesday announced a special deal for this Saturday only, in honor of Sunday's Father's Day. New customers or those T-Mobile subscribers with 18 months of "contract tenure" are eligible to receive a free year of data. To receive the free data, you must purchase a qualifying unlimited talk, text and data plan, including 200MB of high-speed data, on a 2-year contract. T-Mobile will give each customer who qualifies $10 credit per month for the first year of the contract, a $120 value. Those who subscribe to T-Mobile's other unlimited plans with 2GB, 5GB or 10GB high-speed data plans-none of which carry overage fees-will also receive 12 months with a $10 credit per month. Those who sign up for a 2 year contract for a mobile broadband plan also qualify for the $10 per month savings for 12 months. The promotion is available at T-Mobile's retail stores and online. 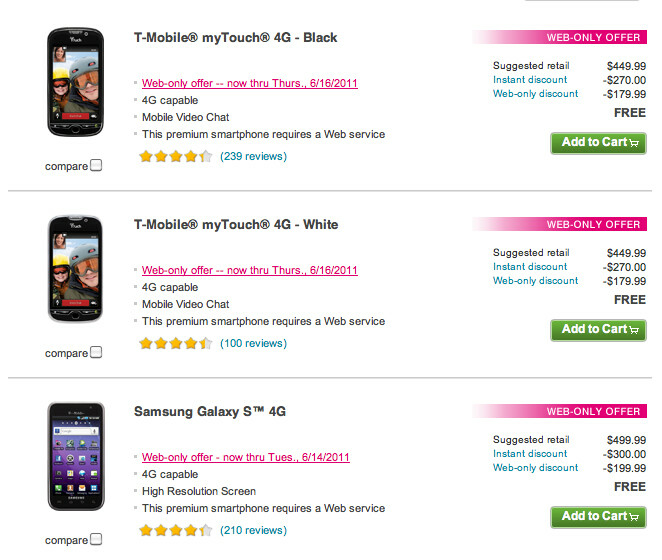 Speaking of T-Mobile's online operations, the carrier has a special deal for online buyers. Today only, order the Samsung Galaxy S 4G online from the nation's fourth largest carrier and the handset is free. Now until Thursday, you can order the myTouch 4G in black or white also for free. The deal is available for new T-Mobile customers, or for those adding a line. Rats, I'm still under contract with T-Mobile, not to mention already maxed my family plan lines limit. This deal is not just sweet, it's freaking sweet. Remember the cost to add-a-line goes up from $10/mo to $30/mo when switching from the 1000 minutes a month to unlimited. AND... unlimited is required to receive the $10 off. And the $10 off is only for 12 months but we only 24 month contracts are offered. Android phones are driving up the costs of monthly service to pay for all the new 4G towers and higher data connections required for towers. It is getting more (by more I mean almost double) expensive this year to get a phone. TMO took away the 2000 minute a month data plans so the only options are 1000 and unlimited.